I received the lei and it is beautiful and smells incredible! Thank you for your wonderful and quick service. The leis arrived in great condition and made two people very happy! Thanks so much for getting the absolutely perfect lei to my hotel to get to my daughter in time for her Graduation. She was the ONLY one in her entire graduation that had a lei...and everyone kept coming up to her and touching it...saying, "is it real?" They couldn't believe how beautiful and fresh it was! Even the Head of the Dance Majors came up and commented how beautiful the lei was!! 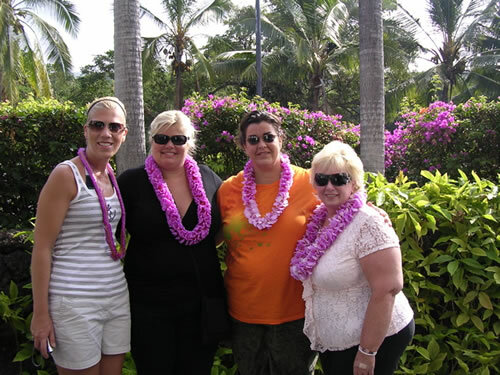 Patty told them to google "Aloha Hawaiian Flowers" so I hope they all find you! We will get this beautiful tradition going on the East Coast too!! This is our daughter Korrin at the Oregon State University graduation. We had so many compliments on the leis, thank you again! I just wanted to say thank you so much for the beautiful fresh orchid leis. They were all so beautiful and all 4 of us really enjoyed having them for our special occasion. graduation. She was thrilled and so surprised. They arrived just in time and looked gorgeous. Thanks for all the help and advice. It really made her graduation day special! I have to tell you about my son Tyler and Christinas Senior Ball. OMGosh the flowers turned out so beautiful! They looked sooooooo good. Everyone loved them. I have referred some people to you for next years dance too! Thank you so much for everything you have done for us with the custom order! Here is a picture of how I used the loose orchid blossoms for the centerpieces in my wedding. The orchids were beautiful � thank you! Everything was perfect! Wow what a fantastic Polynesian Party we had, and thanks to you the leis and Haku headbands and centerpieces were a huge hit! Mahalo to all of you at Aloha Hawaiian Flowers! Just wanted to share some photos with you. You were so helpful and really made our big day so very special! Our flowers arrived from Hawaii to New Jersey for our wedding in perfect condition. Mahalo! We have to tell you how thrilled we were to find your website! The flower leis for our wedding were absolutely stunning and the aqua blue orchid leis matched perfectly with our wedding theme colors. Thanks again - I will definitely recommend you to all of my friends! I received the leis and they are gorgeous! Beyond my expectation actually. I will bookmark your site as I order leis periodically for family events. The Anthurium arrived this afternoon and the plant is beautiful! So many blossoms and one more on the way!! I had ordered one last year and was very pleased how it had performed so I thought I would like to have another one. If this one does as well as the first one I may get adventurous and get a different lava plant next time. They are a great conversation piece and a special touch of home for me as I was born in Honolulu back in 1955. Mahalo for all your help. You have made this ordering of my wedding flowers so easy for me and I can't thank you enough!! Colleen, I just wanted to tell you how pleased we were with our flowers! You went above and beyond to get them to us in time and they were absolutely gorgeous! Everyone at the luau just raved about them! We will definitely order from you guys again!